CSE-H55N was discontinued. Please refer to CSE-H55N2 for alternative. 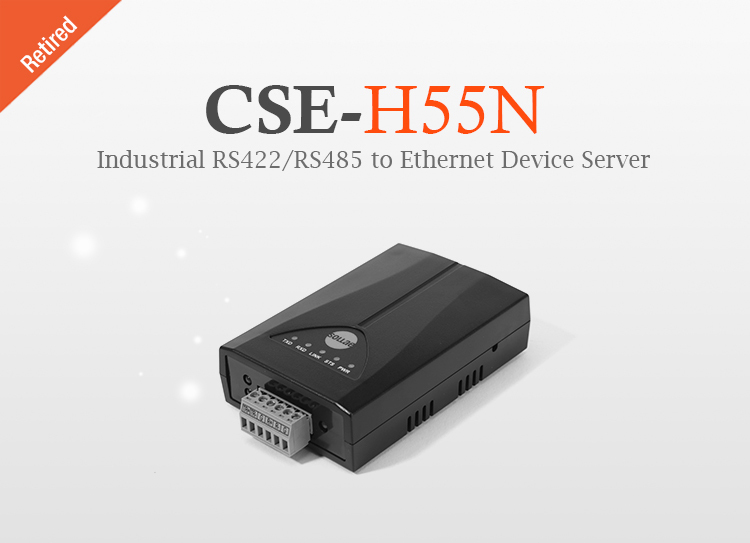 CSE-H55N is an industrial RS422/RS485 to Ethernet converter that supports IPv6 addressing architecture as well as IPv4. It comes equipped with a terminal block for RS422 and RS485 interface. The basic concept of this converter is quickly and easily adding networking capabilities to your serial equipment to help you remotely control and monitor your serial equipment from anywhere in the world. CSE-H55N mainly features industrial operating temperature range (-40℃ ~ +85℃), various communication functions such as DNS, DDNS, and strong security functions (SSL, MAC/IP filtering, etc.). As well as industrial environments, CSE-H55N is ideal for diverse applications such as Solar Energy Management System, Replacement RS485 to TCP/IP network, Remote Controlling Pan Tilt Camera, etc. 2 What is different between CSE-H55 and CSE-H55N? 3 Garbage data come to my socket using RS485 communication!